What is an IP enabled PBX Switch? A Private Branch Exchange or PBX is the brains behind a telephony network and is used to switch phone calls to and from the Public Switched Telephone Network (PSTN). It typically exists in a wiring closet somewhere in the building that a business is located in. In older buildings these are often dedicated rooms with hundreds of small wires connected to a massive piece of telecom equipment. The telecom equipment is connected to the PSTN and results in people in the business being able to make and receive phone calls. Now let's jump into the 21st century. With access to the internet having now become business critical for most companies, a new wiring closet is now necessary that houses all the networking equipment. Most newer buildings will have a wiring closet on every floor and in every building at the same location. This is primarily necessary to allow local area network (LAN) connectivity to desktop computers. So a networking wiring closet contains many switches and routers. Most larger companies will have a network architecture that contains an access, distribution and core layer which is effectively a hierarchy of equipment that facilitates fast network access and redundancy. There is indeed a lot of equipment to manage but having high speed internet access everywhere in a building creates a massive opportunity for every business, as they can now deploy an IP PBX system instead of keeping a non-IP enabled PBX (i.e. an old analog switch). In this article you will learn about the benefits of an IP PBX phone switch in the business world and we will touch on some of the options available to you, particularly in the open source domain. WhichVoIP.com has written many deep dive articles on how to setup a switch for each of the most popular free (or low cost) IP PBXs. If you are in a hurry and want to get to a specific PBX section, use the links below. These are some of the main differences and some of these can of course be considered benefits. However, this alone may not be enough to convince businesses to make the effort to swap out an old PBX and make the up-front investment in a new PBX. Here are some additional benefits that are driving businesses to prioritize this change to the digital world. Ease of use - adds, moves and changes are simple! The figure below outlines a typical Business solution (courtesy of 3CX). 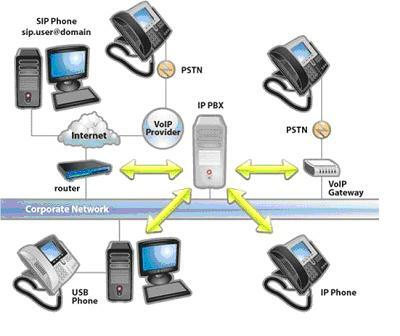 As you can see, the IP PBX is essentially just a computer server running software that acts as the IP switch for phone calls. You see, when traffic is in the digital world it becomes easy for a regular PC to switch the digital packets either between phone extensions or to the outside world using SIP trunks. A SIP trunking provider will then handle the routing of the external calls to and from other VoIP providers, a cellular network or the PSTN. The processing power of PCs, even older ones from 5 years ago, makes this an easy job. After all, a voice call does not utilize much bandwidth when compared to video. An example of an internet enabled PBX switch is a Cisco call manager. The actual call manager is a a simple 1RU or 2RU server that is loaded with either Windows or Linux operating systems. The Cisco call control software is then added to the server and integrates with the operating system to provide call control and other functionality such as voicemail management. The call manager is basically a Graphical User Manager (GUI) where network administrators can go in and configure new phones, features and point to other network devices such as internet gateways. A downside with this type of call control system is that a certain level of expertise is required to configure and manage it and a network admin is typically required. So there are incremental costs for training and potentially adding headcount if the existing network administrator does not have enough bandwidth or knowledge. Another downside with the Cisco equipment is that it tends to be expensive. However, as you will see in the next section there are many outstanding FREE alternatives to the Cisco call manager. Armed with a little technical knowledge and a cheap PC, you can actually have a working phone switch in just a few hours, and it will not cost you a penny. That's the beauty of open-source software, you get to enjoy the great work performed by thousands of Software Engineers across the world, for free! In order to help you with the technical side, WhichVoIP has written many deep dive technical guides for the most popular open source IP PBXs. In the following section we will cover a brief summary of each and provide links to the tutorials we created. Essentially these PBX systems are derived from two underlying switches, Asterisk and FreeSwitch. Asterisk - There are many Asterisk based phone switches but you can also just download and install Asterisk directly from the source and use it for your phone system. There are no bells and whistles built on top of it, such as some of the systems below, but it is perfectly adequate for most phone system needs. FreePBX - One of the most popular open source switches in the world. It is simple to install, partly because of the size of the user base (i.e. bugs fixed quickly), and relatively intuitive to use. It also comes as a full distro that includes the Linux operating system, making installation very straightforward. Note that this is NOT a multi-tenant system, in other words you cannot (easily) have multiple PBXs under one installation. Elastix - Elastix is another popular system and has had over 3 million downloads. It has an intuitive GUI and you can purchase a full system that has both the hardware and software pre-installed. PBX in a Flash (PIAF) - PBX in a Flash has a "home-brew" feel but is actually a very powerful phone system that is built on top of FreePBX, which is based on Asterisk. It is tougher to install than most of the other systems, in our opinion, but does offer some advantages. It bundles together some other applications such as VPN, Travelin' Man (secure remote access) and OpenFire (Instant Messaging) that make this a powerful communication system. Some of the original Engineers from Asterisk left the project and created FreeSwitch. It is also an open-source project but many experts in the VoIP field believe FreeSwitch is a more powerful and scalable system, that can handle much more concurrent calls. It also lends itself better to multi-tenancy. This is very important to service providers that use open source software, since it segregates customers from each other inside a single installation. In other words, customer A cannot call customer B using an extension dial. SipXecs - SipXecs is one of the most well known PBX systems that utilizes FreeSwitch as its underlying engine. It is very powerful and has a rich feature set, including instant messaging and presence but it is a relatively tough installation, making it hard for those new to the land of open source software. Part of the problem here is the lack of documentation, though it should be said that FreeSwitch has a great set of documents and guides online. UPDATE: SipXcom is the new project name for SipXecs. For more information read our guide on How to Configure SipXcom as a Cloud-based Phone System. FusionPBX - FusionPBX is essentially a GUI built on top of FreeSwitch. It is very intuitive to use and with our guide, not too difficult to install. Changes to the GUI updates XML files which are used to configure FreeSwitch. You can use the GUI and/or hand edit the XML files. It comes with a decent feature set although the documentation could be better. 3CX is probably the leader here for Windows based IP PBX phone switches. However, it is not open source so there are fees associated with this software. There is a free version for very small customers but it can get expensive for larger organizations. It is worth it though and is intuitive, easy to install and you will be up and running very quickly. All internal phone calls are free of charge inside your network (i.e. extension calls). However, you will need to connect to the outside world at some point, whether that is to the PSTN, a person using VoIP or the cellular network. To connect to the outside world, you will need a SIP trunking service. These trunks are very inexpensive, often under $20 per trunk and are highly scalable based on your demand. For quotes on SIP trunks, use the form at the top of this page or visit our SIP trunking section and compare prices and user reviews for providers. For small businesses it is often more cost effective, and of course manageable, to look at a hosted PBX switch. With a hosted solution all the capital equipment is stored remotely at your service providers premises. There is also no maintenance or skilled personnel needed for hosted systems, all you need to look after are the phones themselves and they are usually auto-provisioned by the service provider. An IP PBX switch is a great investment for medium and large businesses, often saving 60 to 80% on your monthly bills. They are highly configurable switches though they do require a skilled IT person to maintain the phone system. Internal calls are free since all switching is performed on your local network and for external calls, a SIP trunking provider can greatly reduce your costs to the outside world. The actual capital costs can be small if you are willing to invest some time learning an open-source system. Small businesses are advised to look at a hosted PBX in the cloud since it is relatively inexpensive and removes all the worry of maintaining a PBX.